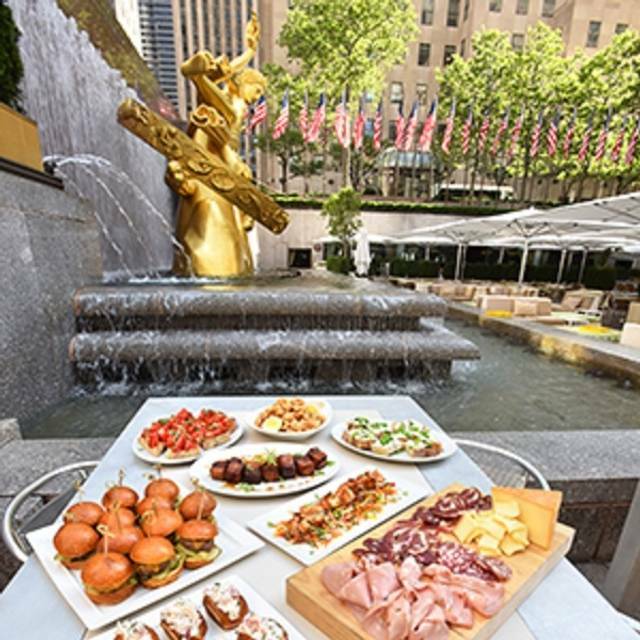 In lieu of our a la carte brunch menu, Rock Center Cafe will serve a special $49 three-course Easter Prix-Fixe Brunch menu until 4pm, with a $25 kids menu for children 9 and under. The Easter Bunny will be in the restaurant from 11am - 3pm and will also be skating on The Rink! 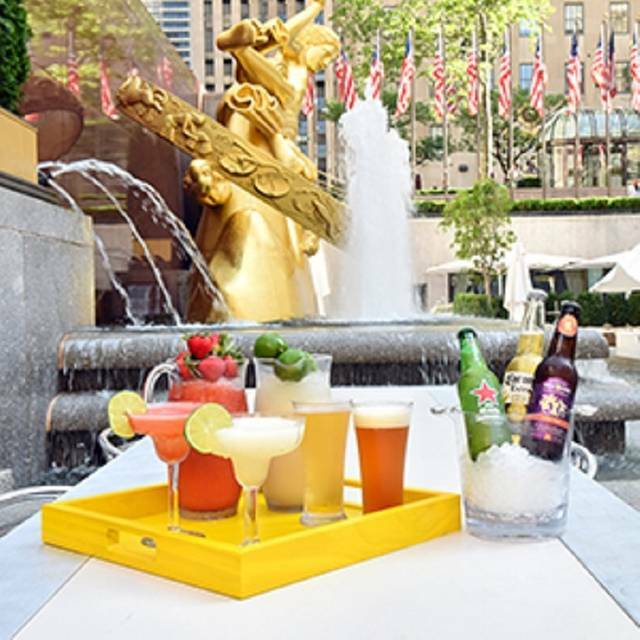 Overpriced Brunch and drink menu. Only redeemable quality is the location and ambiance. Small portion for the money. Tasteless entree. Have been there for dinner with aa better menu and value. Would not go again for brunch. Absolutely the best restaurant in NYC!!! Love the servers and the food! We took our 15 year old twin grandchildren to New York and they enjoyed our breakfast/brunch as much as we did. All four meals were great and the service was excellent. Service was a team effort and not just the person who took our order. 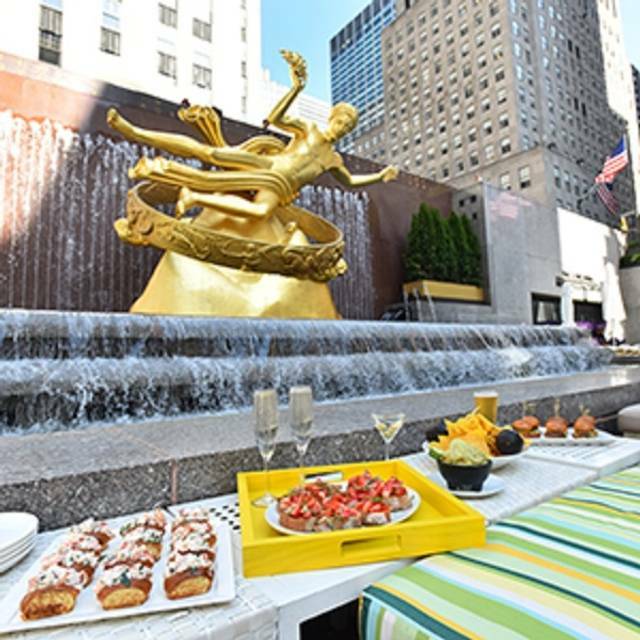 the rock center cafe is one block from my office and, of course, on the skating rink and staring at the prometheus fountain - all three of which are huge pluses! good food/not to expensive. could be a bit quieter. 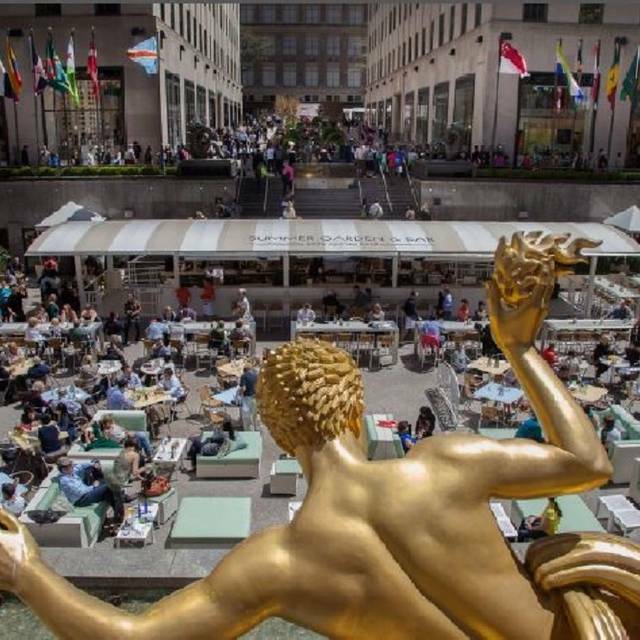 in addition, my dear late friend alice fordyce (the philanthropist mary lasker's sister; later the executive head of her sister's lasker foundation) was rock center's first p.r. person, they couldn't rent any of the stores, etc, and SHE told them to put in a skating rink - the rest is history! wonderful personal associations. and naturally i skated there whenever i came to nyc to visit my grandmother, as a child. Everything was just fine except that we were seated next to the windows, and the a/c was blasting out at our feet. We had to put our coats back on to be able to stay there. Obviously the waiters had no control over that, but it was just too cold to be comfortable. This is a wonderful place for breakfast or brunch in addition to everything else. 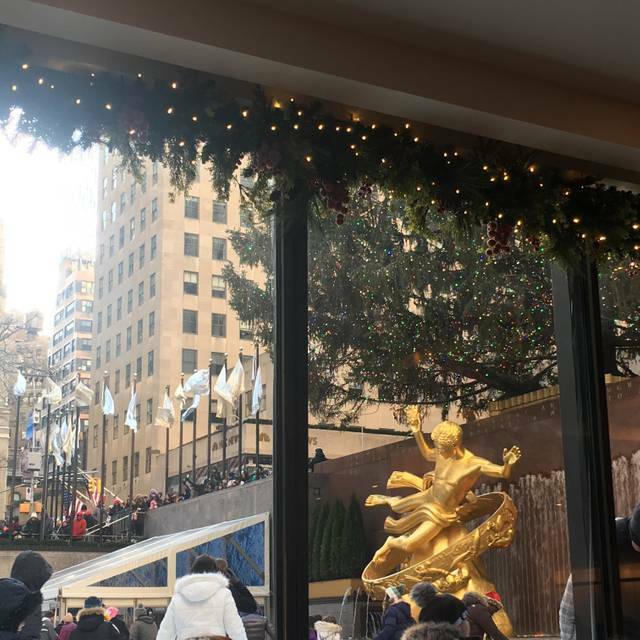 The view is quintessential NYC - Rockefeller Center, ice skaters in the winter, and the magnificent statue of Prometheus all year round. Food is really fine. So is service. All reasonably priced. Prices are typical for this area of Manhattan. We went with our 4 children and they sat us right in front of the windows so we could watch the ice skating. Decent children's menu. Burgers were a little dry. Nice drink menu and appetizer/drinks only was an option. Service was very attentive. I would go again. This is a lovely restaurant with impeccable service. The menu is pricey but fit for foodies! Slow dining, but food and ambiance was great! Excellent food, wonderful presentation, attentive service, lovely atmosphere and view. Great job with pricing. Affordable, luxurious. 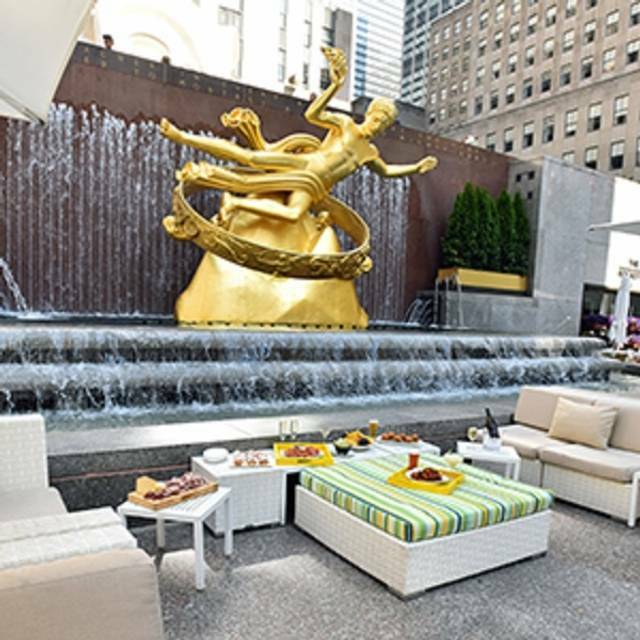 This is a must for any trip we make to NYC! A little pricey but worth it. Staff is always excellent, no rush and a great place to slow down and catch your breathe and just enjoy the experience. The experience was not very personal. Just matter of fact conversation to take care of getting us served. Felt rushed and didn’t feel like we were being heard. This was our last restaurant experience before leaving NYC. I won’t go back to your restaurant. I ate at The Smith, Sarabeth’s, Eataly, Junior’s, and Shake Shack while in NYC. All those restaurants seemed happy to see us and not just business like. When we got our food, it did not save the day. Three of the four didn’t finish their meals. Great food and awesome view! We had a wonderful dinner before our broadway show. food was delicious. loved watching all the skaters on the rink outside the windows. perfect for people watching. great food and great service. we go here several times per year. Waiter was not super friendly. Gnocchi was unseasoned and gooey and had tough outer artichoke. The gnocchi dish was new so maybe they'll improve it. The rest of the table had burgers that they really liked. Fries were good. Location was great and it was easy to get a table on a Friday night at peak time. Food and service is always great. Took my friends who were visiting from Florida. Such an iconic spot in NYC and never disappoints no matter what season you visit. We eat there every trip to the City. Can’t beat the atmosphere, food is very good. 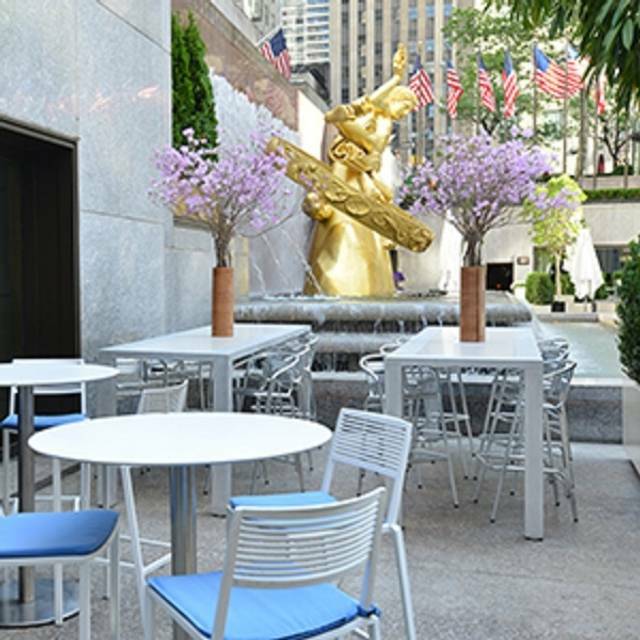 We enjoyed our brunch at the Rock Center Cafe. The prices were high, but unsurprising considering the location. The omelette, eggs benedict, and banana pancakes were all very good. I would not get the Ricotta Bomboloni again. Was celebrating my 50th birthday. Enjoyed sitting and watching the ice skaters!! 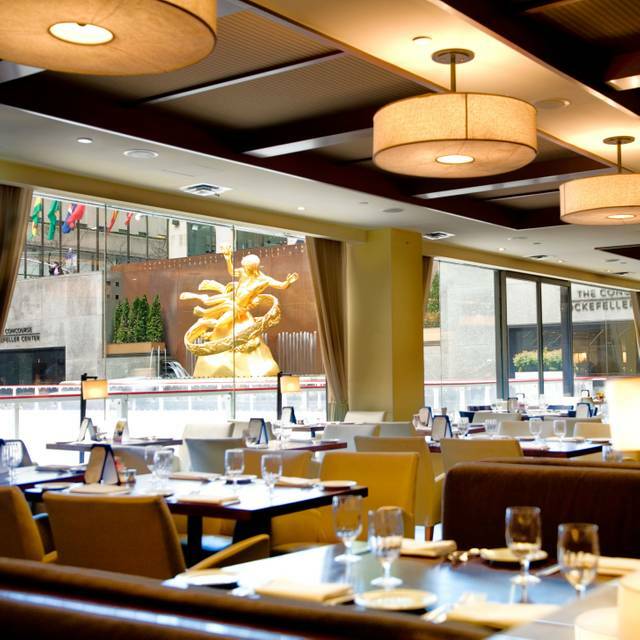 Food and service were ok. Touristic place for those visiting Rockefeller Center. 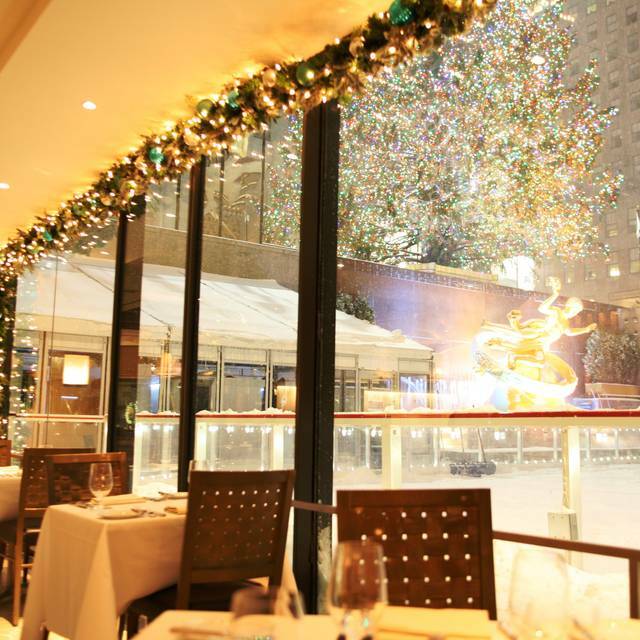 The service was excellent, the staff cheerful, and the view of the skating rink at Rock Center amazing. The noise level is reasonable for conversation, the food was very good, the service was great, and it was nice to be able to look at the window every so often and see the skaters. Criminally overpriced for the quality of food served and service received. Side salad was a bunch of weedy greens with zero dressing. Grilled chicken sandwich was pre-prepared and refrigerated. Seriously? I had to get up from the table and go to the maître'd desk to hand her my bill and credit card because the server was MIA. The noise level was astronomical. $50 for two sub-par sandwiches, no drinks, just water. Couldn't wait to leave - why even bother with coffees? Awful. Will never ever go back. Glorified diner for lunch. Great views of rink. Sorry wish there was a more redeeming feature. Food mediocre especially for the price. Ambiance and view was nice. Lovely experience and super brunch menu. We had a table by the window to watch the skaters, soo New York and sooo enjoyable. Our server was Cynthia and she was attentive and upbeat. The eggs in Bloody Mary 'soup' was unique and delicious. A bit pricey...but worthy just for the ambiance. It was my 11 year old great niece 1st visit to NYC. Her precious reactions left me satisfied. Then to see "Aladin"!! Fantastic service and fantastic food. We had our VIP guests from out of town and the cafe did not let us down. The view is great, and the cafe is very quiet, and all the dishes were superb. Great service and food. Very loud. Service was bad and food was bad. Thanks for honoring our request for a window table! Perfect!